Today, Intel announced top-tier OEM adoption of Intel's field programmable gate array (FPGA) acceleration in their server lineup. This is the first major use of reprogrammable silicon chips to help speed up mainstream applications for the modern data center. Intel® FPGAs are the foundation for a new type of data center with the versatility and speed to handle a variety of workloads, from analytics to financial services. With exponential data growth, data center operators have to balance the need for performance at scale with operational efficiency. To boost performance and power efficiency, data centers are adopting Intel® Xeon® Scalable processors to work in tandem with an accelerator to support data-intensive performance requirements within specific functions in a workload. Intel FPGAs deliver the right match of accelerator-driven performance and operational efficiency in a new range of Intel Xeon Scalable processor-based servers coming from our OEM customers. Leading OEMs, Dell EMC and Fujitsu will incorporate a complete Intel hardware and software stack in their individual offerings, consisting of Intel® Programmable Acceleration Cards with Arria® 10 GX FPGA and the Intel Acceleration Stack for Intel Xeon Scalable processor with FPGAs. "We are very excited to partner with Intel to provide high-performance data centers to our customers," said Kenichi Sakai, corporate executive officer and head of Data Center Platform Business Unit of Fujitsu. 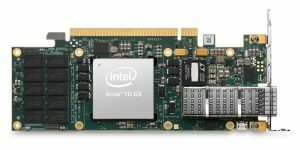 "We are beginning our adoption of Intel Programmable Acceleration Card with Arria 10 GX FPGA with PRIMERGY server and engaging our priority customers. The FPGA acceleration benefits enable operators to tackle the opex constraints while still achieving scale, performance and adaptability." Dell EMC PowerEdge R640, R740 and R740XD servers incorporating Intel FPGA acceleration are now available for volume deployment with more to come. "We are at the horizon of a new era of data center computing as Dell EMC and Fujitsu put the power and flexibility of Intel FPGAs in mainstream server products," said Reynette Au, vice president of marketing for the Intel Programmable Solutions Group. "We're enabling our customers and partners to create a rich set of high-performance solutions at scale by delivering the benefits of hardware performance, all in a software development environment." For example, Intel partner Levyx*, a provider of high-performance, data processing software for big data infrastructures, built an Intel FPGA-powered back testing solution for financial institutions. "Financial modeling is a big data problem with huge performance sensitivities," said Matt Meinel, senior vice president of business development for Levyx. "Utilizing the Intel PAC and the Acceleration Stack, our architects and software developers achieved an eight-fold improvement in algorithm execution and twice the speed in options calculation compared to traditional Spark implementations." The availability of servers enabling FPGA acceleration is another milestone in the rapid ascension of Intel's programmable chips. The acceleration stack provides a software development environment, making FPGA performance and flexibility accessible to the broader developer community. Intel, the Intel logo, Arria and Xeon are trademarks of Intel Corporation or its subsidiaries in the U.S. and/or other countries.